Scared others would make fun of her, Alex hadn’t worn glasses since the third grade. She thought she’d be fine without them. But she loves to read. And lately, the words get blurry, giving her headaches. She feels foolish for worrying about what others thought of her. All she wants to do is to be able to read painlessly as many books as she wants. Inside the clinic-on-wheels parked outside her school, Alex beamed as she stared at herself in the mirror wearing her new black-framed glasses with silver on the sides. “I’m going to wear them all the time,” she said. The 40-foot truck outfitted with two exam rooms and a lens-making laboratory is the first mobile clinic in the region dedicated solely to vision care. Ronald McDonald House Charities of St. Louis and the Eye Care Charity of Mid-America partnered to purchase and operate the van, which began visiting area schools last spring. Even with summer break, the mobile clinic has already visited more than a dozen schools, providing more than 170 children with free comprehensive eye exams and more than 120 with eyeglasses. Alex was among 12 kids recommended to be examined one morning last week at Lift for Life Academy, a charter school near downtown St. Louis. “They are my squinters,” said school counselor Jeanne Godar-Kriss. At Lift for Life Academy, 90 percent of the students qualify for free or reduced-priced lunches, a gauge for poverty. It’s difficult for students to get to an optometrist after failing to see lines on the eye chart, Godar-Kriss said. 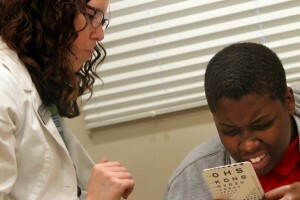 Lack of neighborhood optometrists, transportation, cost and not being able to miss work are all barriers for parents. “Basically, the vision van is a bridge that bring the two together,” she said. Another problem is that Medicaid, the health insurance program for the poor, covers the cost of new eyeglasses only every two years. But children have a tendency to break things. “I was just amazed at the number with broken glasses who were walking around with them,” Godar-Kriss said. Godar-Kris said a proper pair of eyeglasses may not seem like much, but it’s critical. 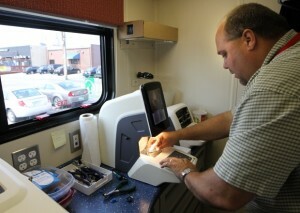 Starting a mobile vision clinic was the dream of Bill Jehling, board chairman for the Eye Care Charity of Mid-America. A year ago, the charity expanded its scope and changed its name from the Clarkson Eyecare Foundation, which Jehling founded in 2004 when he was the president of Clarkson Eyecare to help support the charitable efforts of doctors working in Clarkson offices across the area. The foundation opened two fixed clinics – one in a food pantry in north St. Louis County and another in the Herbert Hoover Boys and Girls Club in north St. Louis – but Jehling said they were just scratching the surface. “I always thought it would be great thing to have a mobile vision clinic, where we could take the services for people to where they need them,” he said. Since 2006, the charity has been trying to raise $450,000 to get and equip a truck. Jehling was lucky to meet Dan Harbaugh, president of the local Ronald McDonald House chapter, who was looking to partner with a health care organization in providing a mobile clinic in the St. Louis area. altRonald McDonald House Charities provides nearly 50 mobile clinics around the world, a program started about 10 years ago in addition to the free housing and support services the organization provides for families whose children are in the hospital. 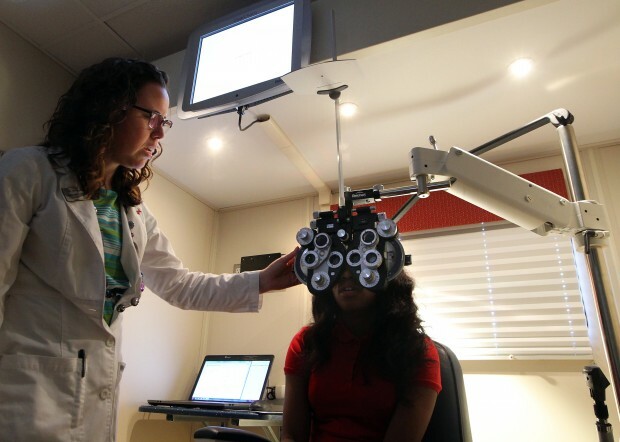 The St. Louis chapter was the first to seek approval for a mobile clinic dedicated to vision care. During the school year, the mobile clinic will visit two to three schools a week in the 14-county St. Louis metropolitan area where the need for eye care is greatest due to low household income. “Wherever the need is, wherever we can take the vehicle, we will,” Jehling said. Early diagnosis and treatment is important in maintaining eye health and preventing vision loss. During exams, doctors can see the beginnings of serious conditions such as glaucoma, cataracts and macular degeneration. By looking at blood vessels in the eyes, doctors can also warn against health conditions like high cholesterol, high blood pressure and heart disease. The mobile clinic depends on grants and donations for operating expenses and upkeep. The charities are also seeking volunteer optometrists, drivers and helpers to staff the mobile clinic so more children can be cared for. Dr. Christy Hayes from Wildwood Vision Specialists started out as a volunteer and was hired part time to keep up with the demand. Godar-Kris said she had 26 students who needed exams when the mobile clinic came to Lift for Life Academy, but only 12 could be seen because Hayes was the only doctor working that morning. Jehling said with steady volunteers, the mobile clinic could operate five days a week.